In the early 1990’s, the clash of politics and religion disintegrated the Federal Republic of Yugoslavia into various warring factions. The brutal struggle between Muslim, Serbian Orthodox and Croatian Catholic caught the attention of the world. People lamented over televised bloodshed and destruction in Sarajevo, on the very same grounds where the Olympics, the international games of peace, were held just a decade earlier. The apparitions of Medjugorje began on June 24, 1981, when the Virgin Mary appeared to six Croatian children on a rural hillside. 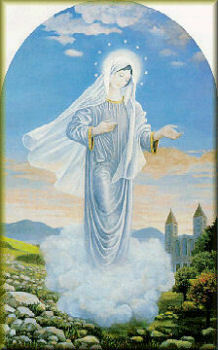 As in the apparitions of Fatima, Portugal, perhaps the most popular of all Marian apparitions, the Virgin comes with the self-proclaimed title, “Queen of Peace.” On occasion she appears escorted by angels. At other times, she carries the infant Jesus in her arms. Her signature sign, however, is the crown of twelve stars she wears around her head, much like the scriptural woman from the Book of Revelation. Today, the six visionaries are adults. They live in Bosnia-Herzegovina, Italy and America, although all of them spend some time in Medjugorje each year. Interestingly, none of the visionaries have entered the religious life, as expected. Instead, all are married are raising children. Whether the seers have elected to lead a quiet, private life, or remain in the public eye, marriage and family is central to their spirituality. First, unlike “traditional” apparitions which typically occur for a very limited time, the number of visitations of the Virgin in Medjugorje have far exceeded any in history. The Mother of Jesus has literally appeared every day since 1981, entrusting her listeners with over 10,000 messages. The messages of Medjugorje – a call to peace and conversion — seem to dovetail on previous apparitions. There is speculation that Medjugorje may be the fulfillment of earlier events. One thing is for certain: these apparitions are the only ones in history, which claim to be the last on earth, a third distinctive characteristic.